Each season of excavation on Trendles Field brought its own surprises. Not least were the discoveries of a small group of human burials in the bank of the semi-amphitheatre (more to come on this soon) and, a few seasons later, a rare Iron Age burial ground. Thanks to all the hard work of our volunteers we now have time to do some additional smaller projects, such as looking in more detail at the Roman coin collection. 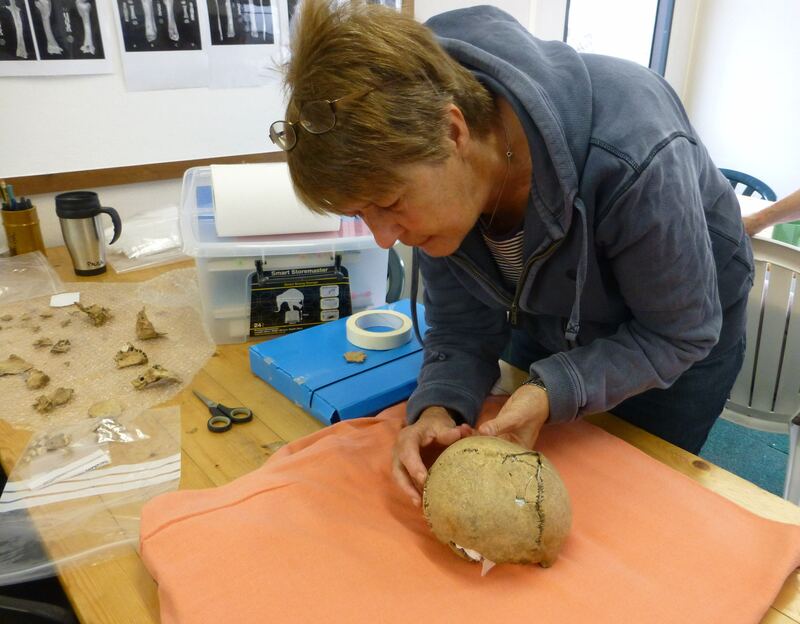 On Thursday we also began the task of examining the people from the Iron Age burial ground. This will involve a detailed look at each skeleton, taking a large number of measurements to work out the height and age of the person at their time of death and to look for signs of any injury they might have suffered. Occasionally illness can also cause changes in the bones or teeth, creating a permanent record of the condition. Most of the Iron Age burials are of young people and for now we have roughly estimated that they were in the region of 12-16 years old when they died. Because of their age we don’t think it will be possible from visual analysis alone to tell whether they were male or female as the bones will not have changed sufficiently to differentiate between the sexes. As we examine the skeletons we will keep a record of some of our findings in a blog under Trendles Topics – so check the link for any news! Roman coins – Friends, Romans, Countrymen, lend me your Hawthorns…..
Roman coins and hawthorns, what on earth is the connection? Well, last autumn Guy Bud, a second year Oxford Ancient and Modern History undergraduate, started looking at our large assemblage of Roman coins from the site. 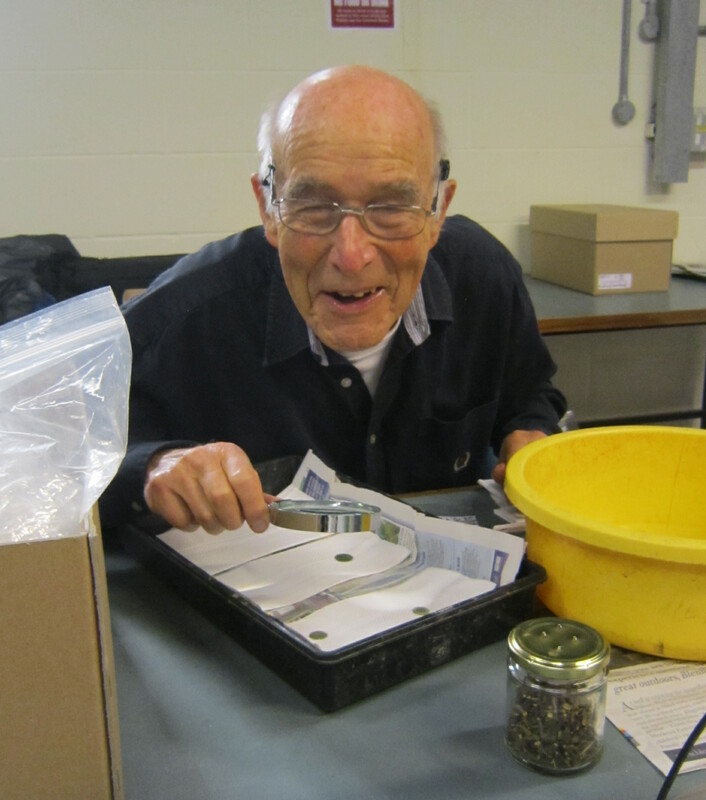 Guy is an enthusiastic numismatist and was interested in looking at the range and nature of our assemblage. In the course of his analysis he discovered our coins came from a wide range of mints all over the Roman Empire, as far away as Constantinople. He also pointed out that the date range spans almost the whole of the occupation of Roman Britain, from the 1st c. A.D. to the very late issues of the early 5th century – though the bulk of our coins are undoubtedly 3rd and 4th c. Our coin assemblage numbers over 2,500 coins and this is largely because it is temple site where coins featured as a major type of votive offering. Guy has also pointed out that some of the coins have been deliberately cut into halves and quarters and some seem to have been pierced. They may have been pierced by a nail pinning them to a wooden post or screen in the area of a shrine as a dedicatory act, and similarly the cutting of the coins could represent the use of coins as offerings. The deliberate destruction or defacing of coins might also represent the well-attested phenomenon in prehistoric and Roman Britain of ‘killing’ objects before offering them to the gods. This act makes them unfit for human use and thereby reserved for the gods only. Our article of the waterlogged pit on this website also discusses the phenomenon of the ritual ‘killing’ of certain votive objects on Roman sites. The coins are being catalogued in detail by Ian Leins, a coin specialist at the British Museum, but this is very much a long-term project, so in the meantime we would like the volunteers to get involved in making our collection more accessible for all and to discover more about the nature of the coin collection in the process. 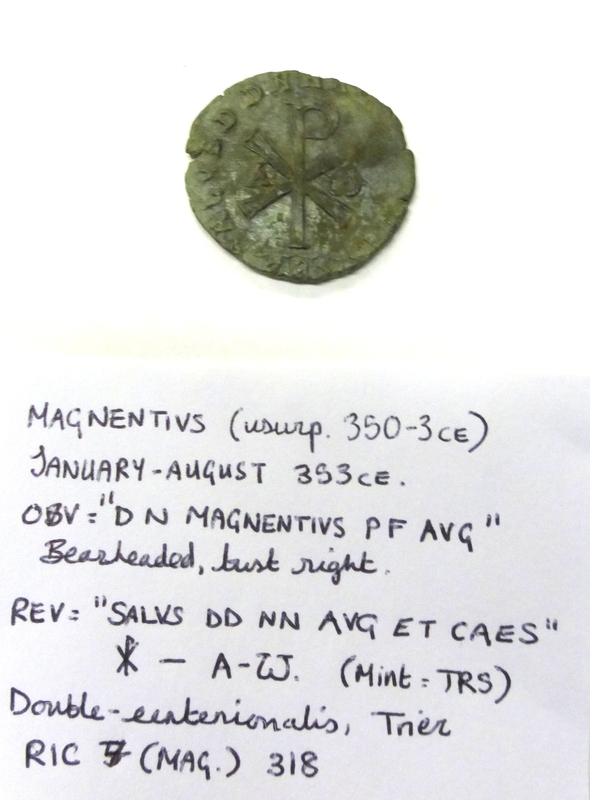 Guy Bud is thinking of doing a small dissertation project on the 3rd c. radiate coins in the collection, and is particularly interested in looking for die-linked coins where groups of coins can be traced to a very specific production site and time. 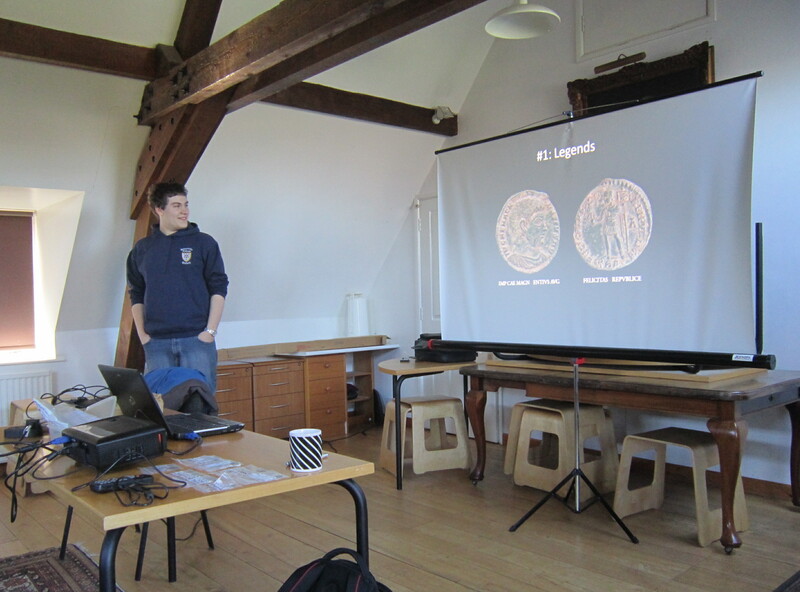 We persuaded Guy to do two talks about the Marcham Roman coins to all our volunteer groups in November and March. Guy revealed so many interesting things about the Roman coins, that a number of the Trendles team were inspired to get more involved with post-excavation work on the coins. One of our volunteers, Trevor Greer (a coin enthusiast and a keen photographer! ), has offered to photograph the coin collection so we can have an extensive photo library of the assemblage that other people can access. In the future we will look into whether we can put this on-line as a resource for both our volunteers and for anyone interested in Roman coins. Though our Roman coins are mostly in a good condition and don’t require specialist conservation and cleaning, there are still a number of coins that are obscured by attached mud. So under Guy’s tutelage, our Wednesday volunteers have started to clean the more robust coins very gently with soap and water. This will enhance them both for analysis and for our planned coin photographic project. 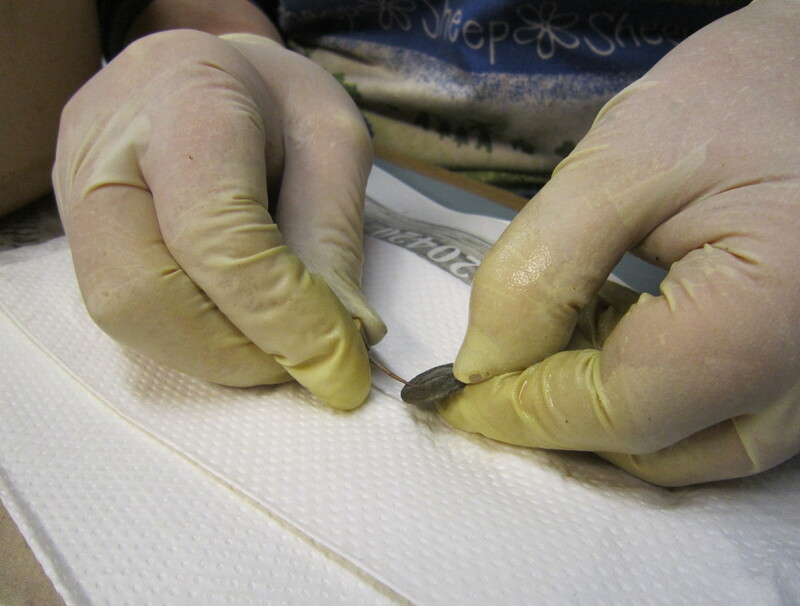 We have been told that the conservators working on the famous Staffordshire hoard of Anglo-Saxon metalwork used natural thorns from hawthorn and other shrubs as the ideal tool for cleaning delicate metalwork. These thorns are both robust, but also very fine and flexible enough not to scratch or damage any delicate metalwork. 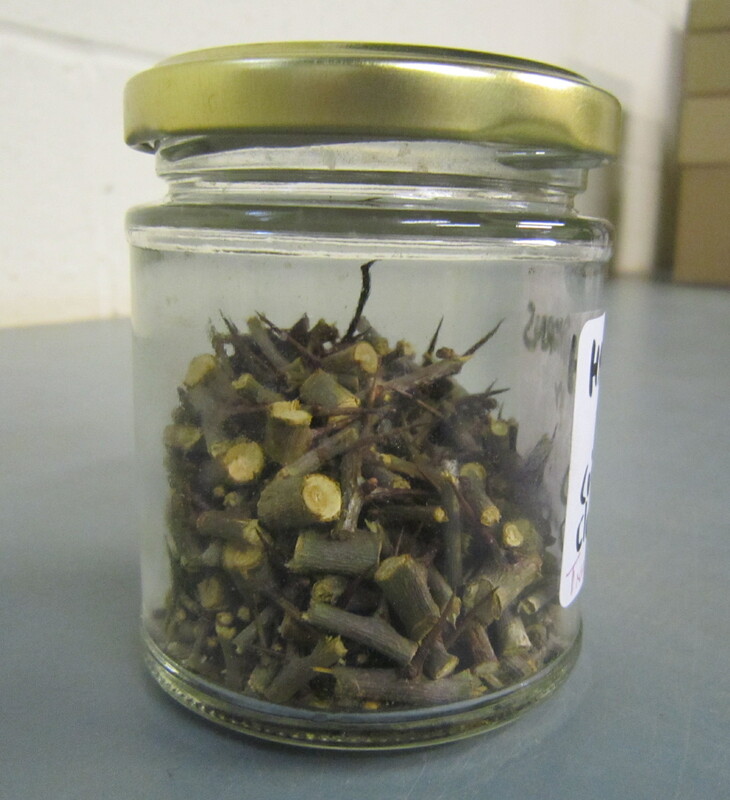 Having discovered it is not easy to find a shop that sells thorns, one of our ever-resourceful volunteers, Steve Nicholson, turned up one morning with a jam-jar full of carefully cut thorns ( taken from his garden) and all ready to use on our coins! Cleaning work using these prickly tools has already started and so far we can attest to them doing the job extremely well! It’s hard to believe that the Trendles Project is one-year old! 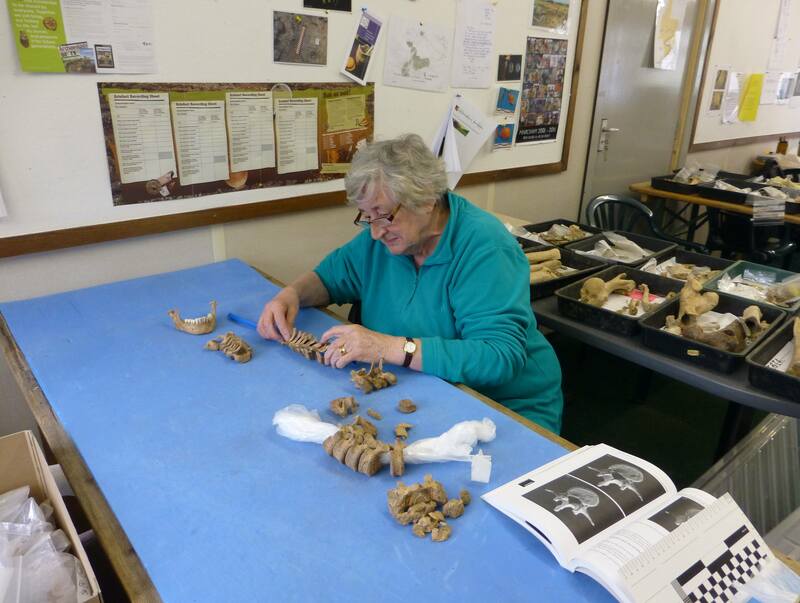 After several months, the teams working on stratigraphy, pottery and animal bone are swapping tasks and learning new skills. The stratigraphy group are the first to go through the changeover. 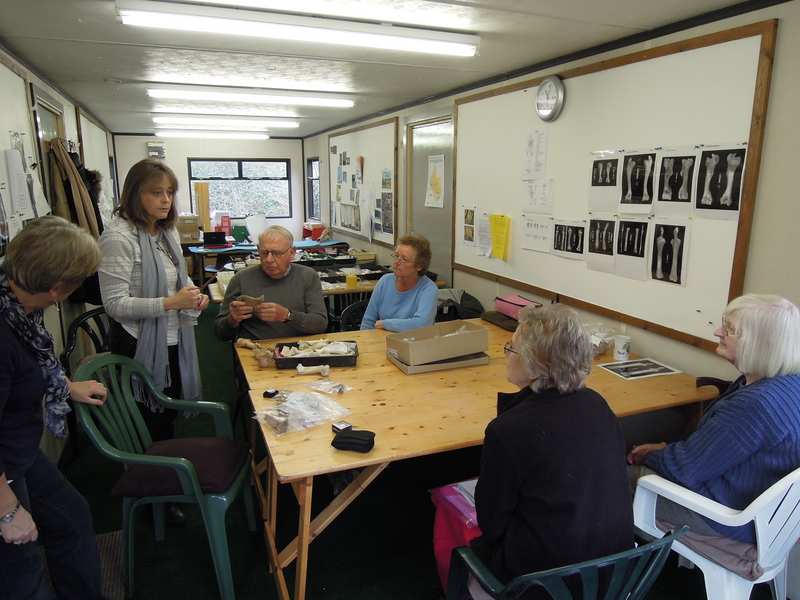 Lisa Brown, our Iron Age pottery specialist spent the morning with the group, and we were all fascinated to hear Lisa explain how the clay was sourced (and sometimes curated) and how the pots were made and decorated. She also showed us the different fabric types and how inclusions such as shell and flint were added to the clay to spread the heat more evenly when the pot was fired. 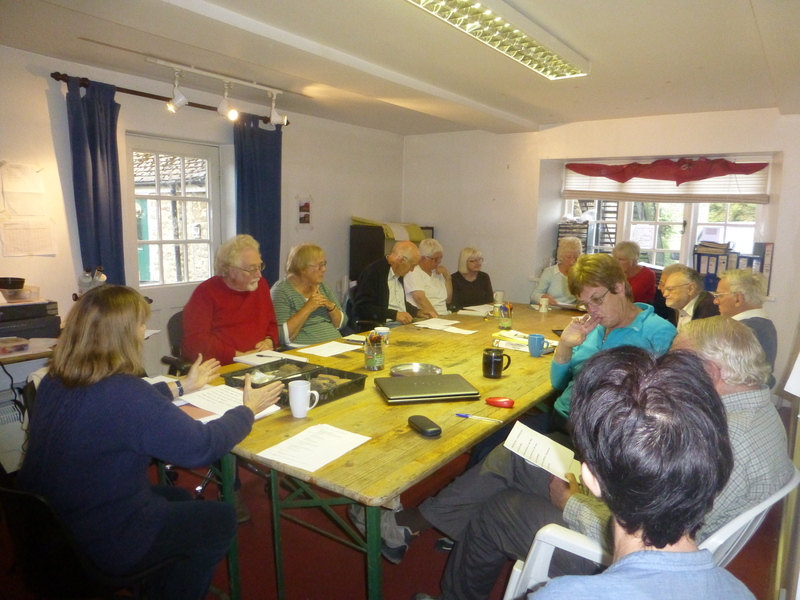 Over the next few weeks the group will learn about Roman pottery and animal bone in archaeology, before choosing what they want to work on the next. 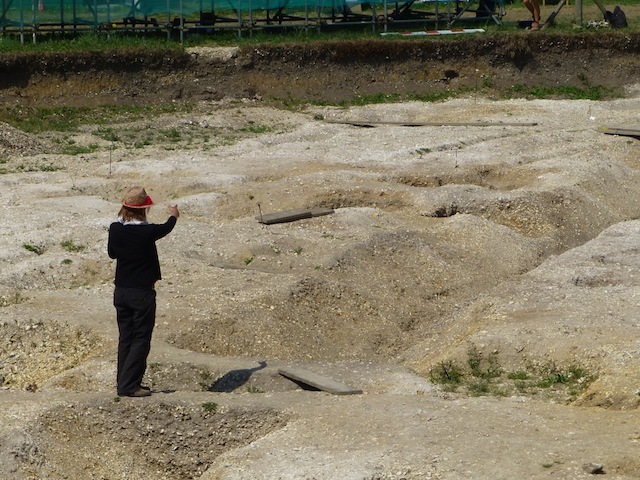 The group took a day off from records, pottery and animal bones to visit Reading University’s excavations at Insula IX and the new trench in Insula III, and were given a detailed tour by Amanda Clarke the Director. The excavation had now reached down to the earliest levels on the site representing the Late Iron Age. The group were able to see the 3rd century Roman road level over a metre above the Iron Age layer with intervening stratigraphic levels. The Iron age streets were interestingly laid out in a north west/south east orientation whereas the later Roman streets were laid out in and north south and east west orientation suggesting who was now in charge at Silchester. This years’ excavation had revealed an Iron Age ditch with an ankle breaker slot rather like a Roman military ditch, but it had been dated by iron Age coins found in the ditch fill. Roman military finds had however been found at Silchester. 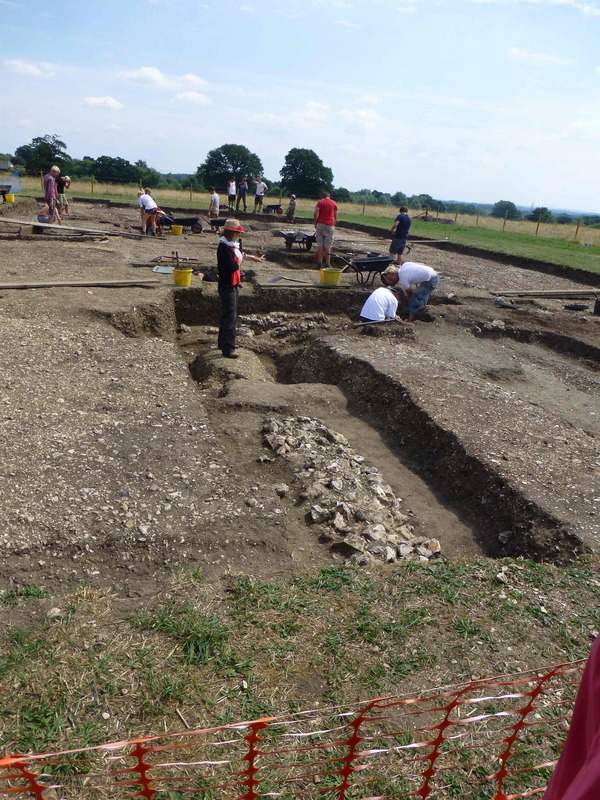 A large rectangular hall outlined by slots and post holes had also been discovered, possibly the largest Iron Age building so far found in Britain and suggesting an important person lived at Silchester. Around it a number of round houses were being excavated. The new Insula III had been opened to locate the alleged Roman Baths possibly part of an important building as some monumental stone work had been located in Insula IX which may be associated with it. Unfortunately the Victorians had appeared to have just dug a large hole destroying valuable stratigraphy and had not dated the buildings. This emphasised the value of modern methods of excavation, recording of the stratigraphy and finds in order to date and interpret the archaeology in post-excavation. Some walls were however appearing and some late Roman archaeology near the surface which had been missed by the earlier excavators had been found so all was not lost. The tour was concluded with a visit to the ‘finds area’ where the recently washed material was laid out. A number of cases containing the various pottery types found at Silchester showed great similarity to the types currently being processed by the Marcham group. 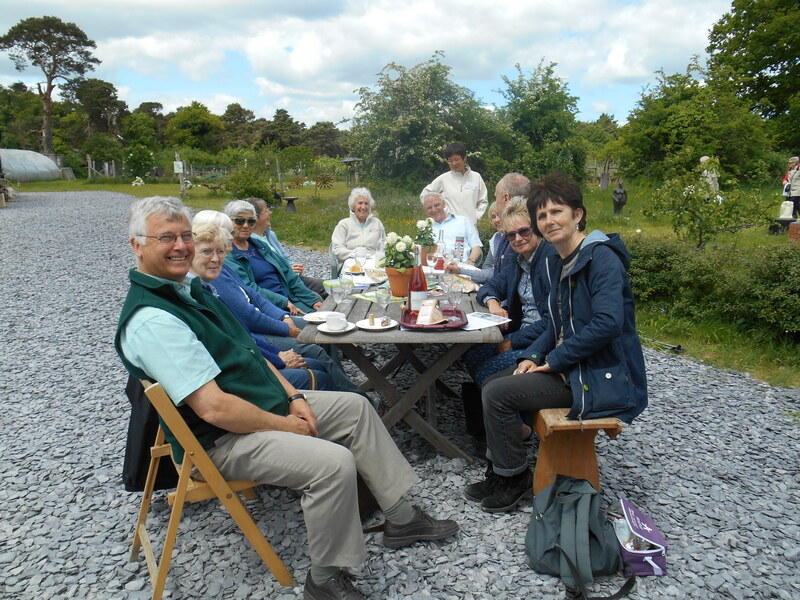 The finds manager showed the group some of the special finds of Roman metal work including a copper alloy toilet set, a brooch and an unusual jug handle shaped like a leg and foot. There was also some unique glass imported into the late Iron Age settlement in the Ist century AD. The richness of the objects hinted at a wealthy community possibly the base for King Verica or another important Iron Age leader, in touch and trading with the Roman world before the conquest.